We have the best prices on aftermarket autoparts in Fort Myers and all of SW Florida. Order your parts today and save! We can also delivery your aftermarket auto parts to you. We specialize in aftermarket auto parts for window motors and regulators, fuel pumps, side view mirrors, headlight assemblies, tail light assemblies, door handles, power window switches, a/c control panels and much more. We have the best prices on aftermarket auto parts in all of Southwest Florida! We offer the most affordable window motor and regulator in the industry. We have one of the largest selections of front and rear headlights and tail light assembly’s at the best prices in Southwest Florida (all brand new). So when you are looking for aftermarket auto parts call Priced Just Rite we can help locate the part you are looking for. Once again our prices are the best in town when it comes to aftermarket auto parts in Fort Myers and all of Southwest Florida. 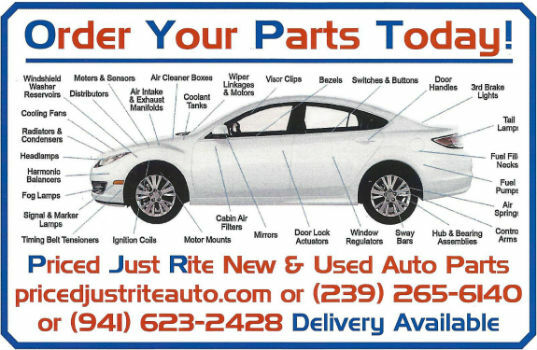 We also carry a full line of used auto parts in addition to our aftermarket auto parts. We supply auto parts for all cars and trucks and all models. Foreign and domestic cars aftermarket auto parts in stock at all times. We provide parts to individuals and to shops throughtout all of Southwest Florida.